The Raptor's sharp claws are in evidence on most holes. 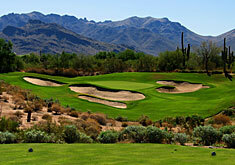 Most golfers have heard about the Grayhawk Golf Club. Its Talon and Raptor courses have both been raking on Golf Magazine’s Top 100 You Can Play list. The layouts hosted the Accenture Match Play Championships three times in the 1990s, and a trio of Fry’s Opens in the last decade. It’s the home of a learning center bearing the names of Peter Kostis and Gary McCord. Phil’s Grill, which offers pricy but excellent fare, is named after that Phil, who back in the day used to hang around the joint fairly frequently. So what is it about the meticulously conditioned courses and the service that drives such opposing and strongly held opinions from visitors? I have one friend who hates coming out of speakers hidden under fake rocks near the bag drop, putting green and clubhouse, although the choice in music, 1970s and 1980s rock, is plenty good. He also hates it when attendants are overly obsequious, but then he’s cranky. Another friend, the late and great Ed Rentner, called the place “heaven and hell,” and described the Raptor as being “meaner than the Talon.” It has everything you love and hate about modern golf architecture, Ed once wrote. “At 6700 yards from the back tees and 7100 from the tips, it has formidable length. If you miss the fairway, you’ll find yourself in unplayable desert rock and flora. You’ll find cross bunkering to please the eye, but your mood will change upon entering them. Greenside, they’re extremely deep and profoundly sculpted, with thin, unforgiving sand. Finally, the huge mounded, rolling or terraced greens offer an abundance of pin placements. They’ll mock many a well-conceived and struck pitch or chip. “ Ed did, however, like the course conditioning and Grayhawk’s food. The Raptor course at Grayhawk is a remarkable golf course. The course includes spectacularly beautiful golf holes, and challenging, technical layouts. It is a true pleasure to play, and it is a gem, especially as a public course. The Fazio design includes dramatic bunkering, and a brilliant intertwining of desert and grass . . . you are in for a real treat. With bunkers that are extremely receptive, the Raptor's greens are well protected. And then: WORST golf experience in Arizona. Show up early hoping for breakfast, but kitchen doesn’t open until 11. Food from snack bar was awful. Course in very poor shape for price asked. Ball washers (when found) are empty, now towels or water offered. Course all tricked up. Totally unfair. Cart girl developed bad case of attitude when she didn’t get the tip she expected. Could not buy food at turn because no one was working snack bar. Too fat and greedy for me. The Raptor may not be as mean as the Talon, but it also has its share of bunkers. Then again: From the minute I got out of the car to the minute I left, the service was fantastic. I played Talon because of its reviews. It was a very tight course. Target golf with plenty of bunkers, deep bunkers! Immaculate in its condition. I showed up as a single and they gave me the option on the range of who I would like to tee off with, allowing me more time on the range. Pace of play is great and never felt rushed once. Customer Service: A+. Having played both courses several times, I tend to agree with both. The architecture is indeed appealing to the eye. However, even a player with a handicap that’s high single digit is going to struggle these courses, especially from the back tees. 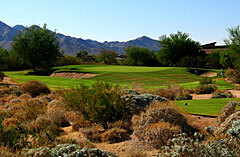 The desert here is unforgiving and perhaps more so than at many other Scottsdale area courses. One day at Grayhawk can feel like three, stimulating a need for an early cocktail and bedtime, although shooting a round in the low 80s is also a cause for celebration. Both the Raptor and Talon presents holes that will make your heart soar. But when a mound feeds a good shot into the cactus, the predators will eat it raw.